UC13441 is what specialists refer to as a ‘Base-ring II juglet’, imported from Cyprus during the second half of Dynasty 18. Thanks to the studies of Robert Merrillees, we now know that this specific kind of vessel was used to trade opium (used in antiquity for analgesic purposes, for inducing sleep, and for calming the nerves). These sorts of juglets—as well as their predecessors, Base-ring I juglets (e.g. 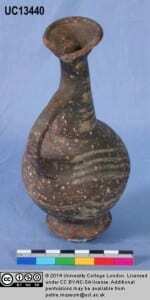 UC13424)—were one of the most common goods imported from Cyprus during Dynasty 18. The surface decoration of UC13441 may be informative not only about the dating of the vessel, but also possibly about aspects of the preparation of opium prior to trade. The white/yellow-painted linear decoration on the outer surface—encircling the junction between the neck and shoulder, the junction between the handle and the neck and vertically on the belly—is characteristic of the first phase of production of the Base-ring II type; the second phase is characterised by the spread of the linear decoration over the whole vessel (e.g. UC13440). In contrast the earlier Base-ring I types do not show the use of painted decoration on the outer surface. This surface decoration of UC13441 assists us in determining its date of production and trade, which was not before the reign of Amenhotep II and not after the beginning of the reign of Amenhotep III. Beginning from the reign of this latter king, the progressive evolution of the painted decoration over the whole surface of Base-ring II juglets can be observed. UC13440 The evolution of decoration. As suggested by Merrillees this change in decoration may be associated with the evolution of the method of extracting opium from poppy heads. The white/yellow-painted linear decoration may be reminiscent of the white opiate juice which is exuded from the poppy head after its incision. Merrillees has argued that a refinement occurred in the procedure of extracting opium, which was reflected by the change in decoration of the items used to transport it. On the other hand, could this change in the outer decoration simply represent a natural evolution of the style and fashion taste, which led to the use of paint instead of clay relief ridges? UC13441 alone provides a rich resource for analysis. It is, however, only one of more than 65 base-ring Cypriot vessels, or parts of vessels, in the Petrie Museum. There are therefore considerable opportunities for gleaning even more information on the trade of opium from Cyprus to Egypt in the late second millennium BC. Why are all the juglets bent and what evidence we have that they contained Opium? One of the most important markers which refers to opium is the shape of the vessels themselves, which are reminiscent of the poppy head. This specific shape may have been a sort of emblem which indicated the content. Moreover chemical analyses have been carried out on the preserved contents of some of these bil-bil juglets and the results confirmed the hypothesis. The bent is an integral part of the decoration patterns of these vessels. Having completed my doctoral work on the question of whether there is an opium connection with the Base Ring juglets, I must disagree with Dr. Gasperini’s assessment of the evidence. There is only a single positive result for opium in these vessels that stands up to scientific scrutiny. (See Bisset et al. 1994 and Koschel1996 in Aegypten und Levant). In my own work, I have performed both degradation studies on opium and analyzed a number of these juglets with no evidence of opium residues. It is possible that an opium connection exists with Egypt as it pertains to the use of these vessels, which would make future chemical analysis of the vessels in the Petrie Museum an interesting project. I based my considerations on the association between Base ring juglets and opium in previous studies (for example, see “On opium, pots, people and places” – Merrillees 2003), and I am of course glad to know that more recent investigations are shedding new light on this important aspect. Thank you for your comment.